The three-century-long ownership chain of the Gomez Mill House in Marlboro is a many-tiered, richly-textured layer cake of personal stories. Specific historic periods lend unique flavoring to each personal history. But in the case of the recently-rediscovered activist Martha Gruening (1889-1937), her early-20th dreams of a better, more just world have a distinctly modern resonance. Gruening was one of five talented children of Dr. Emil Gruening, first chief of ophthalmology of New York’s Mount Sinai Hospital. The four sisters and one brother led active lives, steeped in idealism. One sibling, Rose Gruening, founded the Grand Street Settlement in New York City, and was known as “the angel of Grand St.” Another, Ernest Gruening, was a territorial governor of Alaska and is still remembered for his role in espousing Native American rights. In 1912, Martha, who was a close friend of W.E.B. Du Bois, took the suffrage movement to task for failure to promote African-American equality. Perhaps her greatest, single contribution was an exhaustive study (undertaken with long-time friend and collaborator Helen Boardman) of lynching in the United States, which formed the basis for the publication by the NAACP in 1919 of a book entitled Thirty Years of Lynching in the United States. Lynching began to decline after this work appeared; it is reasonable to assume that Gruening’s work helped save many lives. Gruening never married, but adopted an African-American child. Her beloved son David must have been one of the motivations for her interest in providing “colored” children with the kind of outstanding education she had experienced at the Ethical Culture School in New York City. In addition, education that would promote progressive values was a life-long interest for both Gruening and Boardman (who was connected with the New York Board of Education Experiments, which eventually evolved into the renowned Bank Street School for Children). In 1917, Gruening found a full page ad in the New York Times, offering for sale “ONE OF THE MOST UNIQUE & HISTORICAL HOMES IN AMERICA.” William Joseph ‘Dard’ Hunter was a key figure in the Arts and Crafts Movement. In 1912, he had purchased the historic Gomez house in the Hudson Valley, where he built a water-powered mill for making his own paper, in order to pursue his dream of creating entirely hand-made books. The pressures of wartime (and an interest in expanding his paper enterprise to a commercial scale) caused him to put the house on the market. “The house, the mill – and all the surroundings blend together so charmingly…. It is doubtful that another such place could be found in America,” he told the reader. The school was not a success; it is not currently known to what extent it actually functioned. A few years later, the building went back on the market and was sold in 1925. Like many obscure historical figures, Gruening’s lasting influence is subtle, but has become part of the fabric of American society. Most of the current knowledge about Gruening was unearthed by Susan C. Dessel, a visual artist who finds inspiration for her work in remarkable historic women who are not yet widely recognized. Although not a professional historian, Dessel conducts in-depth research on each of her subjects, and to aid future researchers, has compiled an in-depth bibliography of Gruening’s work. Her lovely series of banners entitled “BRICK IN A SOFT HAT (Portraiture of Martha Gruening) Series 2 Nos. 1-8” incorporate Gruening’s own words in delicate filigree patterns that capture her idealistic spirit as imagined by the artist. Dessel credits her discovery of Gruening to a visit to the Gomez Mill House and conversations with then Executive Director Ruth Abrahams. At the Gomez Mill House, the work of studying its many layers of ownership history, and melding their stories into a living museum, continues. 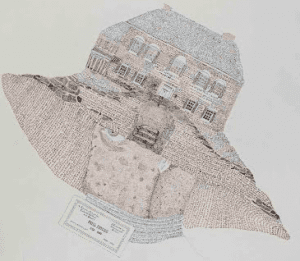 Photos from above: Gomez Mill House, courtesy Richard Rosencrans, Jr.; Brick In A Soft Hat, (Portraiture of Martha Gruening) Series 2 No. 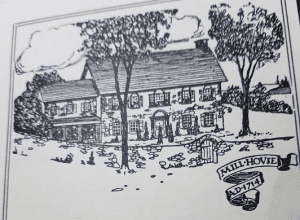 6, artist Susan C. Dessel©, photographer Robert Puglisi; and Drawing of the Mill House taken from Dard Hunter’s ad in the New York Times. Thank you for the much deserved attention paid to Martha Gruening and the Gomez Mill House. Thank you for introducing Martha Gruening and The Gomez Mill House to an ever-expanding public. Her work is relevant still today. I would like to contact Susan C. Dessel to talk about another local woman who worked for social change, Hilda Worthington Smith. She lived just up the river in West Park (Ulster County), and , among other things, established a school for women factory workers to learn community organizing skills, the Hudson Shore Labor School. Send me a note at MicGree@gmail.com. I understand Susan is busy on a major new project right now, but I will be happy to introduce you. Terrific to learn of the existence of Hilda Worthington Smith. I have just completed research for my next piece and will be creating the art over the coming months. Thank you for bringing Smith to my attention. It is definitely worth a visit. Richie, the person who leads the tours is very informative and full of interesting stories. I did a storytelling program there in the summer and included a story of Matha Gruening in the presentation. Each of the occupants of the house are interesting in their own right. Fascinating story. Btw, Ernest Gruening later served as U.S. Senator from Alaska and was only one of two senators to cast a vote against the Tonkin Gulf Resolution in 1964–the resolution that paved the way for American entrance into the Vietnam War.